Grace Blakely is about to destroy the peace that has settled on Embassy Road. A now sixteen year old Grace Blakely witnessed her mother’s supposed murder when she was only thirteen. She finds herself being transported from army base to army base spending only summers at her grandfather, the U.S. ambassador’s, mansion. But, Grace is now permanently moving in with her grandfather. Just like everybody else, he does not believe her mother was murdered. Grace is constantly telling herself she is not crazy like everyone thinks she is. Bent on finding her mother’s killer after she sees him in person, she acquires help from Noah, Rosie and Meghan, the only people who are willing to trust her. She discovers the murderer living on Embassy Road working for one of her grandfather’s friends. Her grandfather, his receptionist, Ms. Chancellor, and even her brother’s old friend, Alexei have been informed of him by Grace. So why will nobody help her and her newfound friends stop the murderer before he strikes again? At first this book can be confusing, but a reader will soon become used to the world of All Fall Down. With the constant action, including breaking and entering into a suspicious murderer’s house, underground tunnels in a major city and retrieving a scarf that could break country bonds, it is hard to put down. Humor, mystery, suspense and action can be found. Plot twists are everywhere in this book that will leave a reader wondering what’s next. 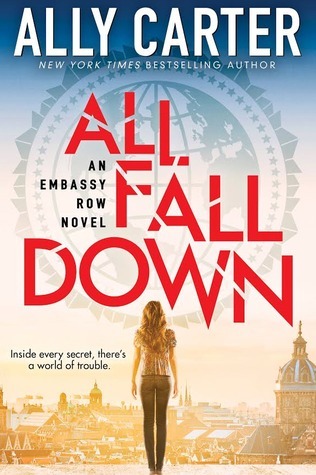 All Fall Down is the first book in the uncompleted Embassy Row series. Recommended to anyone who loves action and suspense. The perspective is limited to Grace, but like Ally’s other books it’s very intriguing as a reader can never know what other characters are thinking or doing. I, personally, loved this novel and cannot wait for the next book to be released. While I am waiting I will definitely start reading Ally Carter’s other books for her tension-filled writing style that is so attention-grabbing and somehow makes the book very realistic aside from being fictional.